How could anyone of a sane mind trust a government that tolerates corruption in just this one massive agency fraud allow them to oversee an entire socialized healthcare system, Republican or otherwise, for an entire country? Never mind what they "promise" - - look at their track record! Look Ma, No Oversight! Living in a "free" America does not mean others should work, save, raise a family and have the added burden of a debt incurred by others. Any congresscritter or legislator of either Party supporting more government in our lives is either a genetic freak, a fakir, a "Me-Firster", or all of the above and doesn't deserve your vote. Medicare has helped make thousands of doctors into multi-millionaires, according to new data released by the federal healthcare program that shows just 2% of practitioners accepting the insurance received nearly a quarter of all payments. The 24% of all payments made to this small group amounted to $15 billion of the $77 billion in taxpayer money paid out by Medicare in 2012. The New York Times reported that a hundred physicians alone took in $610 million that year. This group included a Florida ophthalmologist, Salomen E. Melgen, who was paid $21 million, as well as dozens of doctors, primarily eye and cancer specialists, who received more than $4 million apiece. Thousands of ophthalmologists, in fact, have done well by treating macular degeneration in seniors. The numbers: 3,300 of these eye doctors received $3.3 billion from Medicare. Clinical laboratories and ambulance services account for about $13.5 billion of the $77 billion total. The release of the Medicare data has been long overdue, according to critics of the entitlement program. But it took years of litigation, which included staunch opposition from the American Medical Association, before a federal judge last year lifted a decades-old injunction preventing the disclosure. “This is actually the most useful data set that Medicare has ever released,” Dr. Bob Kocher, a former Obama administration official and current partner at Venrock, a venture capital firm, told The New York Times. Other observers said the information could spur more lawsuits involving Medicare fraud. “There’s a lot of potential for whistleblowers and justified worry for fraudsters,” attorney Steven F. Grover, who represents whistleblowers, told the Times. “There’s going to be a lot of litigation over this,” he said. The Los Angeles Times reported that the two highest-paid doctors listed in the Medicare data are being investigated by the government for improper billing. 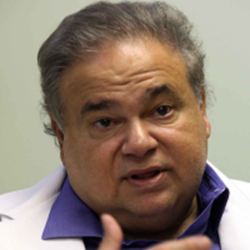 Salomon Melgen, the Florida ophthalmologist, and cardiologist Asad Qamar have both contributed heavily to the political campaigns of Democratic candidates in Florida.